PharmaVision is integrated with TraceLink Track & Trace Services (https://www.tracelink.com/solutions/track-and-trace) within the scope of the Pharmaceutical Track & Trace System in effect in Turkey. 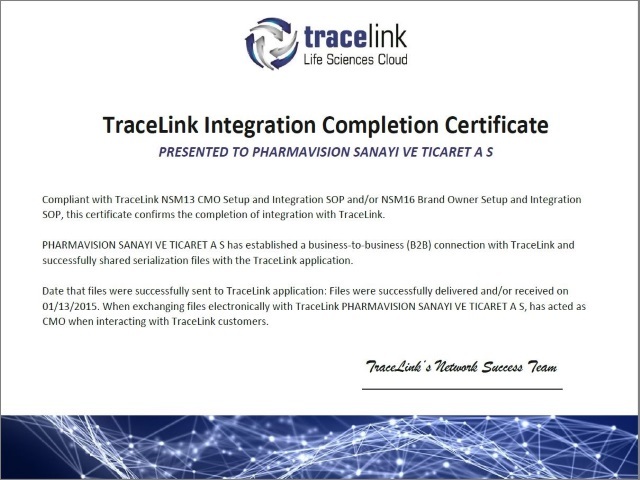 PharmaVision customers working with TraceLink can benefit from this integration. PharmaVision can automatically obtain, without the participation of the customers, the sequence numbers to be used in the products to be produced and also share the numbering status formed after production automatically via TraceLink.